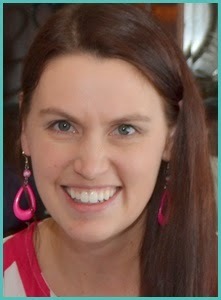 I came across this really fun apron swap about a month ago It is called the Flirty Apron Swap. I decided to take the plunge and try it. I think I got the perfect person to send one to. 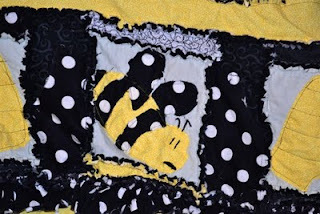 I have been wanting to applique bees for awhile now. 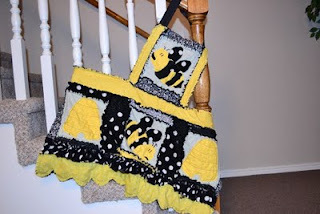 I have had the pattern made up for awhile now but just hadn't had the time or reason to sew something with bee's on it. The lady that I sent my apron to loves bee's. She loves everything about bee's. Perfect! So I made her an apron using THIS pattern. I even added pockets for her. I will show you have to adjust the pattern tomorrow to add the pockets. Now how did I applique the bee's and the beehive? 5. sew with a straight stitch around each piece and where indicated. 6. I used a really tight zig zag stitch about a 1/4 inch wide for the eyes and the antennas. The antennas are not on the pattern pieces. I just kinda eye balled them in place. 7. Finish the product that you are making and then wash it to fray the edges a little of the applique. Great apron! I'm sure your partner will love it! How cute! I will have to make this apro, you've gotte me hooked on your rag quilt aprons!